Lead actors Zareen Khan, Gautam Rode and Abhinav Shukla hosted a press event for their upcoming film Aksar 2 in Mumbai on September 21, 2017. The actors talked about their film which will be the sequel to the film Aksar. The makers of the film had earlier released a motion poster as well as the trailer of the film which is ready to be released in theatres on October 6, 2017. Zareen at the press event looked pretty in a shirt with embroidery and a printed skirt while Gautam was seen in a formal shirt and a trouser. Abhinav appeared in a casual t-shirt, a stylish jacket and a pair of denims. Aksar 2 is the sequel to the 2006 film Aksar. 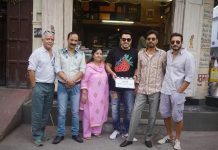 The upcoming film is directed by Ananth Narayan Mahadevan and produced by Divjot Kaur Bindra. Aksar sequel also stars Lillete Dubey, Mohit Madaan, Sofia Hayat and Emraan Hashmi in a cameo appearance. The makers have earlier released a couple of songs from the film which have already become popular among the listeners. Exlusive photos of Aksar 2 team at the press conference!